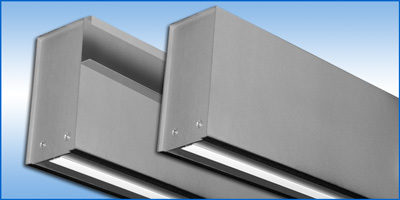 Field adjustable diffuser for one or two way horizontal discharge patterns, or vertical flow - 180° adjustable. Integrates with inverted T-bar and 9/16" narrow slot grid systems. Adaptable to hard surfaces using mounting frame. 1/2" Internal glass fiber insulation. External insulation, and “fiberless” insulating systems available. Round volume damper in inlet. 1/2" Internal glass fiber insulation. Lay-In T-Bar • SCR-L 15/16"
Lay-In T-Bar • SCR-L9 9/16"
Narrow Slot • SCR-D 9/16"